Deezer today made its music-streaming service available to anyone who wants it in the U.S. The service was previously limited to Cricket Wireless customers and those who owned Sonos home stereo equipment. Deezer's offering is similar to Spotify, Apple Music, and Google Music in that it provides access to millions of tracks, radio stations, and podcasts to mobile devices. 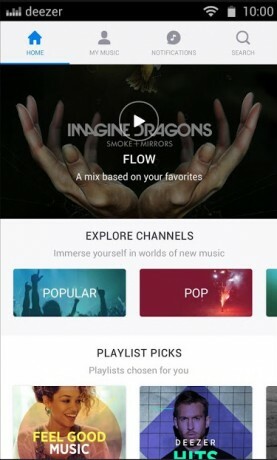 Songs can be streamed or downloaded for offline playback. Deezer is available to Android, iOS, and Windows devices. The app itself is free to download, but the Premium+ experience requires a $10 monthly fee. Deezer this week said its music streaming service will soon be available for streaming on the Google Home smart speaker. Deezer competes with Spotify, Google Play Music, Apple Music, and Amazon Music Unlimited. Spotify today revealed a new way for people to manage their music. The company developed an app specifically for watchOS and the Apple Watch. Apple today made iOS 11.4 available to the iPhone, iPad, and iPod Touch. The most significant new feature of iOS 11.4 is AirPlay 2, a more advanced version of Apple's wireless audio technology.